What is a horizontal cantilever gate truss? It is a single plane truss, very much like a building truss. Relative to cantilever gates, it is a rigid frame made from smaller tubing. It may be integrated into the gate frame at the time of fabrication or it can be an independent truss with a complete frame that can be fastened to the gate after it’s been installed. 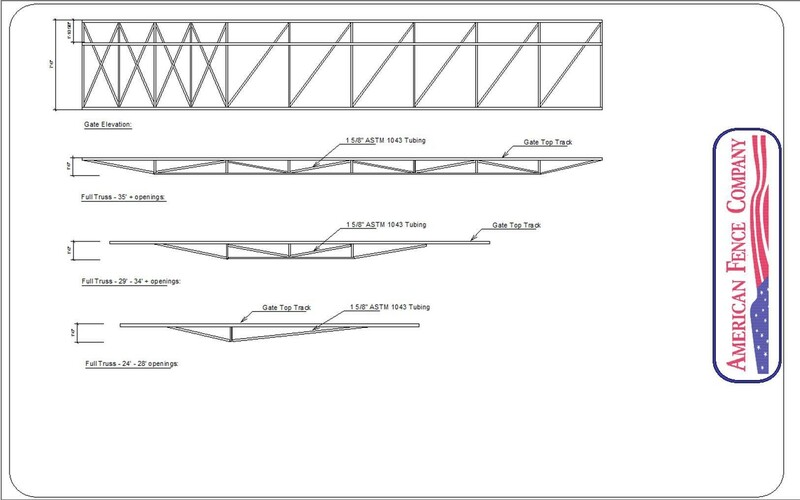 The images below demonstrate a truss system that is integrated into the gate fabrication. If you review the 35’+ truss, it may be viewed as both a truss joined into the gate or a standalone. Why would one use an independent truss? Simply put, for ease of transportation. More than likely these trusses are used because originally it was not considered necessary, or the gate was initially manual and later became automated. When would one use a horizontal truss? A cantilever gate requires a truss when it is automated and reaches an excess of 24-foot opening. Please refer to the lengths shown below in the images. Is a horizontal truss the most optimal solution? No. If a gate is to be automated and reaches the lengths below, the best option is a double track aluminum cantilever gate. These gates effectively deal with the wind load due to the combination of the double tracks and their widened frame. What is the biggest concern with a horizontal truss? These trusses are not supported by ASTM 2200, as they stick out too far from the gate frame, posing a danger to pedestrians. Please note that none of the images below show a blunt end to the truss. All are designed with an eased sloped end as to minimize the chance of serious harm in the case it comes in contact with bystanders. Do you need a better solution for an existing gate that won’t provide for a horizontal truss? American Fence Company has your solution. 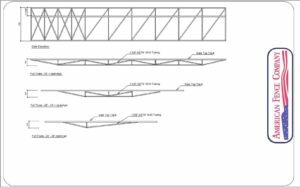 Please refer to the illustration below with the opposing cable truss design. This is a cable truss system that has a very thin profile. A tube is attached to both sides of the gate at the midpoint that runs horizontally across the length of the gate. The tube is a carrier for the cable, which is installed in each tube while being anchored on one end and anchored on the other with a turnbuckle-style tightener. The cables are tensioned equally, creating an opposing force against each other. As these forces build, the gate gains rigidity. This is very similar to the concept of post-tensioned concrete. This is an exclusive American Fence Company design.